I’d heard rave reviews about the stunning beauty of Patagonia’s ‘O’ Circuit, but I wasn’t prepared for it to take me to a transcendent new world. Towering granite spires, sprawling glaciers, breathtaking mountain passes, intense and ever-changing weather — I experienced it all on every step of my six-day journey. Trekking in Torres del Paine National Park had exposed me to a completely different type of outdoor experience than I’d ever known. Chile’s proudest national reserve – located in the far reaches of the Patagonian wilderness – is a mecca for outdoor enthusiasts worldwide. 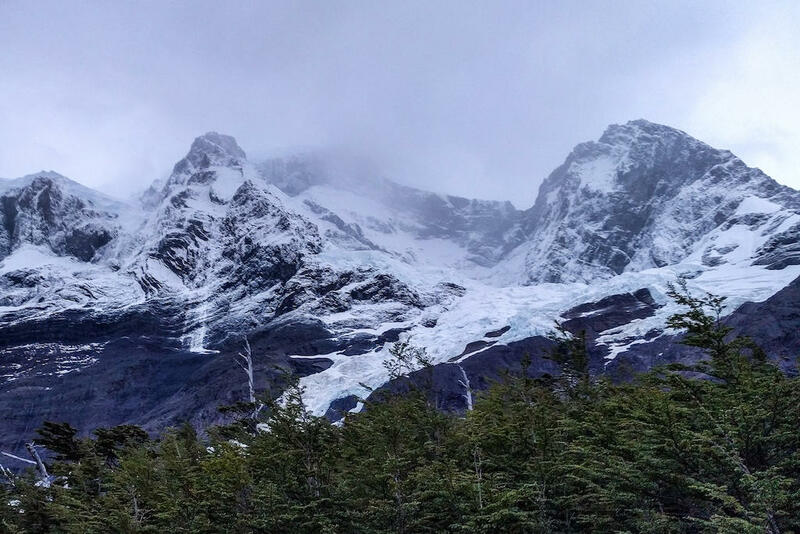 A quarter million visitors travel to Torres del Paine every year, and now I know why. Within the park exist the captivating ‘O’ and ‘W’ Circuits, two multi-day hiking trails that bring trekkers face to face with some of the most jaw-dropping landscape our world has to offer. You can complete the ‘O’ or ‘W’ Circuit safely and affordably on your own, just as I did. You don’t need a guide. Let me tell you how I did it. 1. What is the ‘O’ Circuit? What is the ‘O’ Circuit? 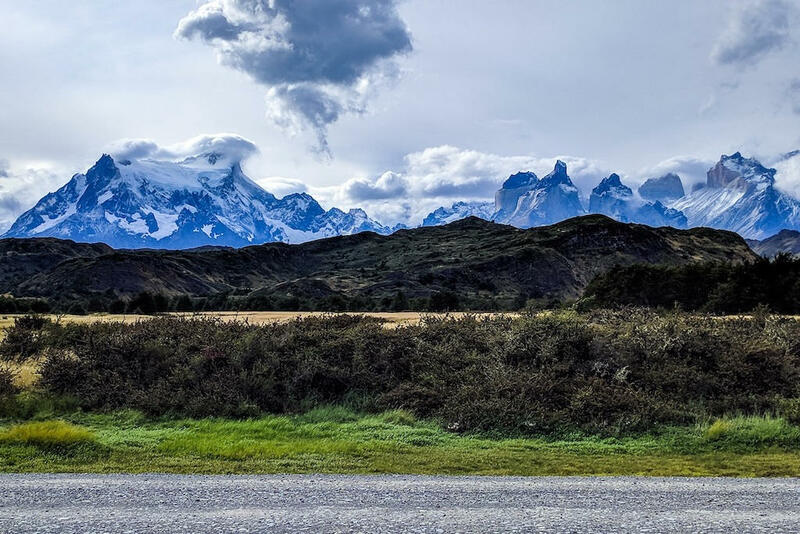 In short, the ‘O’ Circuit is a 123-kilometer loop around the scenic Cordillera del Paine mountains within Patagonia’s Torres del Paine National Park. The trail includes the popular ‘W’ Circuit (67 km), and wraps around the backside of the spectacular mountain range, eventually connecting to make a loop. I’ve included a map, below, to show you the routes for both treks. The trail is full of challenges: steep inclines, long intervals, and notoriously erratic weather. To solo hike the ‘O’ Circuit requires a substantial chunk of planning and preparation. Most people choose to complete the trek in 7 to 10 days. Some hike it quicker, some take longer. I decided to hike the loop in 6 days, which is the fastest itinerary I would recommend. 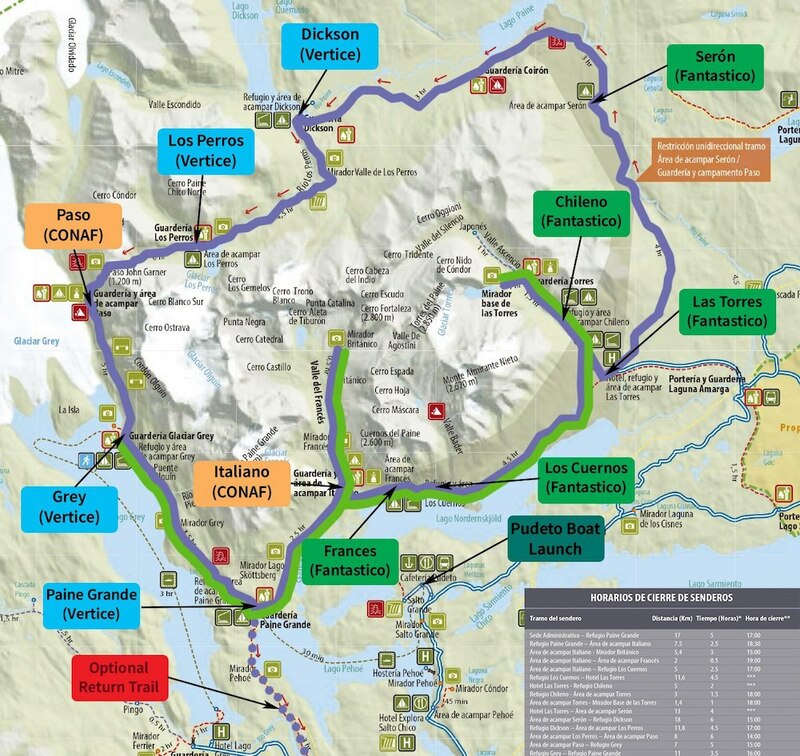 There are three trailheads to choose from to begin the ‘O’ Trek: Grey (accessible by boat), Paine Grande (accessible by boat), and Las Torres (accessible by car or bus). The backside of the circuit (the ‘O’ portion) MUST be hiked counter-clockwise. The hiker traffic on the backside of the mountain is drastically less than the front side, which is why it was my favorite stretch of the trek. The ‘W’ and ‘O’ Circuits are Patagonia’s most famous treks but only allow for limited traffic. Don’t risk getting turned away — make all your reservations months in advance. Procrastination might result in a booked up calendar. BOOK YOUR RESERVATIONS BEFORE ANYTHING ELSE! There are three different websites from which you can book campsites and refugios (cabins with beds) online. Study the trail map, distances, and elevation changes carefully to plan your itinerary. You’ll need to visit two or three websites to book your entire trip. Most campsites will turn you away if you show up without a reservation and rangers won’t even let you onto the ‘O’ side of the trek without proof of camping/lodging bookings. Get creative with your itinerary if specific sites are full and entertain all options as you plan your trip. Not Available: Electricity, showers, food, gear, supplies. Price: Campsites starting at $8 US per night. Dorm bed starting at $35 US per night. Amenities: Water, bathrooms, showers, electricity, gear rental, re-supply shop, restaurant. Price: Campsites starting at $8 US per night. Refugios starting at $35 US per night. Price: Campsites starting at $8 US per night. Dorm beds starting at $35 US per night. Price: Campsites starting at $10 US per night. Dorm beds starting at $55 US per night. Price: Campsites starting at $20 US per night. Refugios starting at $110 US per night. Amenities: Water, bathrooms, showers, gear rental, restaurant. Not available: Electricity, re-supply shop. There are plentiful options to take guided tours where reservations, food, and gear are all provided. While I prefer to trek solo, join a private tour if reservations are full, you’re an inexperienced trekker, or don’t want to bother with carrying gear. 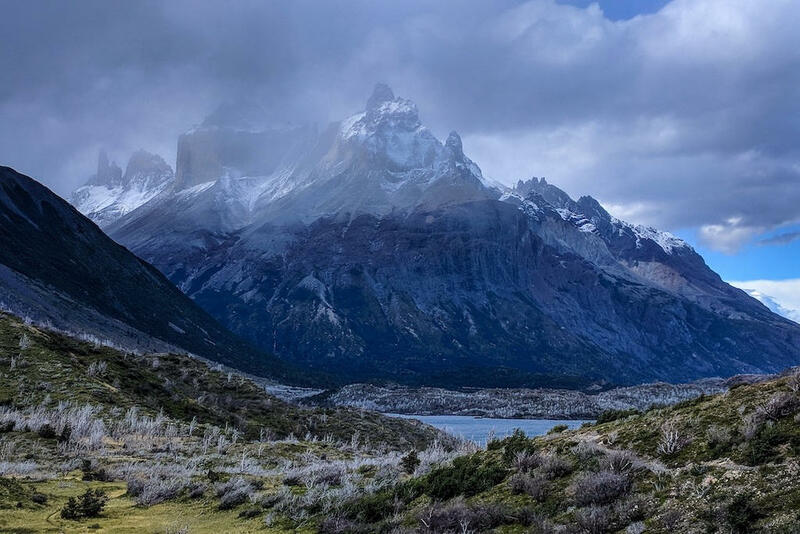 Torres del Paine National Park is tucked away deep in Patagonia, far from any major cities or hubs. Luckily, getting there is fairly easy and affordable. 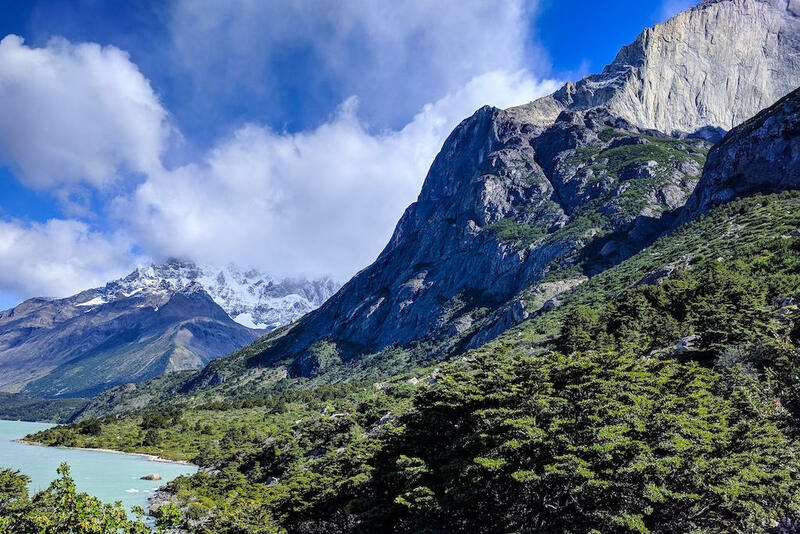 Direct flights from Santiago and Buenos Aires will get you to Puerto Natales or El Calafate – backpacking towns that are within a few hour drive of Torres del Paine. Puerto Natales is the most convenient launching point for those preparing to visit Torres del Paine. Affordable three-hour direct flights are available from Santiago. 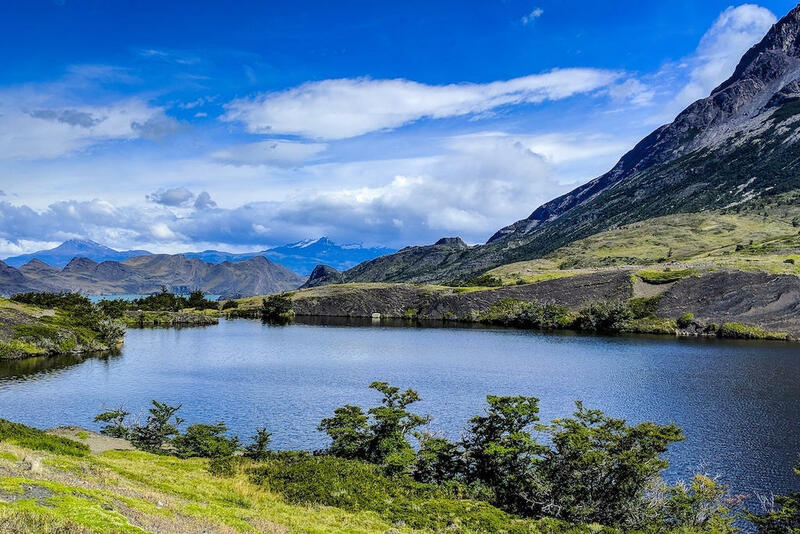 From Puerto Natales, Torres del Paine is just a three-hour bus ride. Two daily buses depart from the main terminal – one at 7:15 a.m. and one at 11:30 a.m. I recommend using BusBud.com to buy tickets in advance. If you are trying to reach Torres del Paine via Buenos Aires, flying into El Calafate is the fastest and most affordable option. Direct, three-hour flights depart daily from Jorge Newberry Airport. Bus tickets from El Calafate aren’t available through commercial companies like BusBud.com or BusSur.com, because the trip requires a border crossing. You can, however, purchase tickets through certain hotels and hostels, but they are rather expensive due to the border crossing. I paid $90 US (62,700 CLP) for mine through America del Sur Hostel. Book your ticket a few days in advance to assure you get the bus you want. 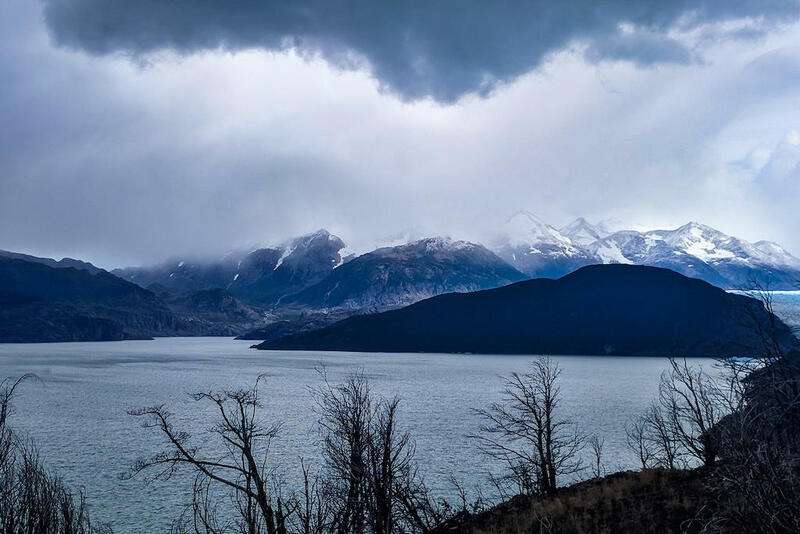 The trip to Torres del Paine takes at least five and a half hours from El Calafate – four hours of driving time and about an hour and a half at the border for passport control/customs. It took me almost seven hours to get to from my hostel to the trailhead. I highly recommend staying in Puerto Natales the night before your trek, if at all possible. You’ll save yourself money, time, and headaches. Many trekkers choose to hitchhike into Torres del Paine from Puerto Natales or El Calafate – I saw dozens lining the road along the way. Hitching a ride in Patagonia is extremely popular, so be prepared to compete with other travelers for potential rides. Find a suitable spot to post up, stick out your thumb, and cross your fingers. Hostels and hotels are abundant in Puerto Natales, Punta Arenas, and El Calafate. I stayed in great hostels in each town and can highly recommend any of them. 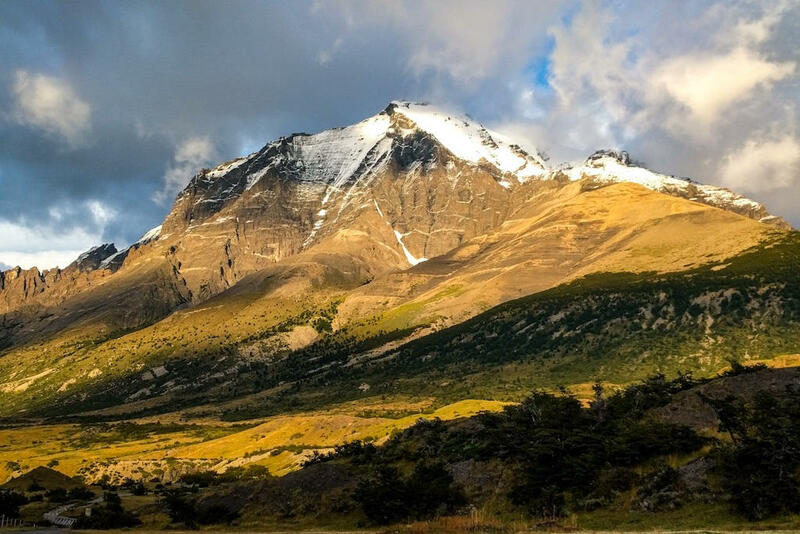 Preparation requires more than simply booking campsites and finding your way to Torres del Paine. Getting ready for the ‘O’ Circuit took much more time and effort than any other trek I’d ever experienced. It’s worth it, of course, so prepare early and often. A common misconception is that hiking the ‘O’ or ‘W’ Circuit is an expensive endeavor. 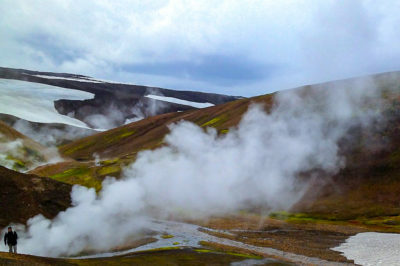 While it certainly can be (some tours cost upwards of $4,000 US!) it possible to pull it off affordably if you plan correctly. 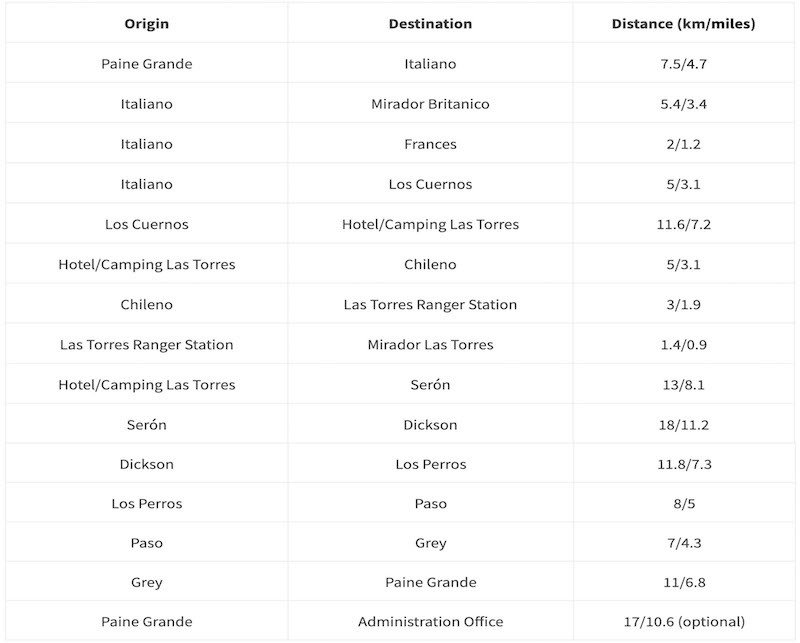 Here are my approximate expenses (minus airfare) for the whole trek. I always try to be a frugal traveler and found it easy to complete this trek at a reasonable cost. There are no ATMs in Torres del Paine National Park. Bring enough cash to pay the park entrance fee and buy any food, lodging, supplies, or transportation (catamaran, bus) within the park. Some shops accept credit cards, but the majority of businesses only accept cash. A calm day in Torres del Paine is a rare occurrence. I found out quickly that weather from all four seasons is fair game on the ‘O’ Circuit during peak season, much like the majority of Patagonia. Be prepared for intense rainfall, brisk temperatures (0-13°C/32-55°F), and powerful winds that can reach up to 180 km/h (110 mph). Keep an eye on the conditions as your trek draws closer and prepare accordingly. WindGuru has, by far, the most detailed an accurate forecasts available for Torres del Paine, I highly recommend saving the upcoming week’s weather information before starting your trek. Maps. me is an extremely useful offline navigation app that has trail maps from hikes all over the world. I highly recommend downloading this app ahead of your hike. I downloaded a GPS map of the entire Patagonia region (‘O’ Circuit included) before my trek and used it frequently to track my progress. Sure, the trail is very popular and well-marked, but downloading offline maps provides an extra layer of security on top of a physical map. Maps.me is free and extremely helpful, so why not download it? The entire ‘O’ Circuit trail is available on the app and easy to follow, so download it ahead of time. Drop a few waypoints before you start the trek, so you know where specific destinations and landmarks will be. You won’t need cell service to use the maps. I also recommend downloading this guide onto your phone so that you can access it while offline along the circuit. Knowing what challenges to expect ahead of time will help you prepare accordingly. You’ll need a backpack full of quality gear that will hold up to the notoriously windy and rainy Patagonian conditions. 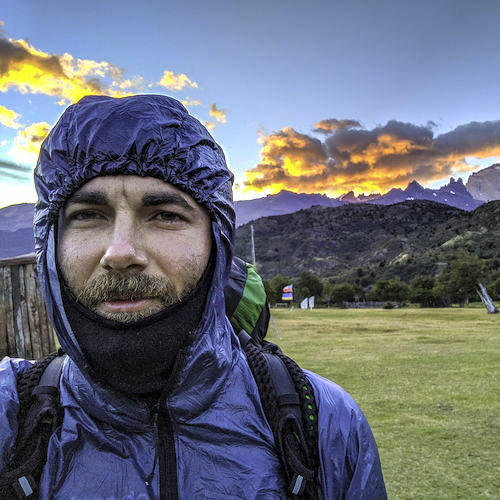 The weather in Torres del Paine is no joke – bring gear that can stand up to it. Here’s a complete list of the lightweight gear I brought along on the ‘O’ Circuit. I keep my pack as light as possible. Resist the temptation to overfill your backpack and only carry what you need — the less weight on your back, the better. I’ve also written a post about the seven essential pieces of gear to bring on any trek. Focus on getting these seven particular pieces of equipment dialed-in, and you’ll be set up for success along your trek. Puerto Natales and El Calafate have plentiful mountaineering and trekking stores that will rent out the gear you need for your hike. Backpacks, tents, sleeping bags – it should all be easy to find at these shops. 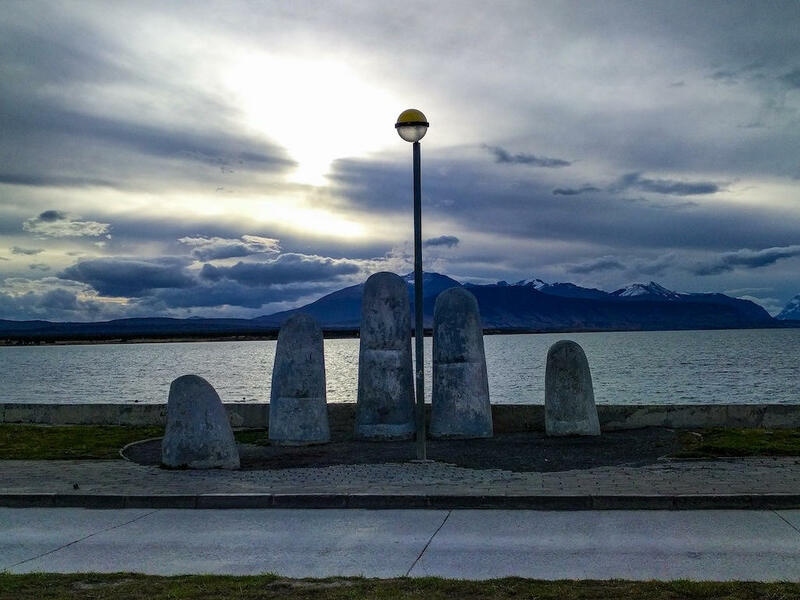 Here’s a helpful post for renting gear in Puerto Natales. And here’s one for renting gear in El Calafate. Of course, gear rental is expensive, so I always economize by bringing my own equipment. Researching and buying a lightweight setup ahead of time is an excellent investment in budget travel. There is plenty of clean drinking water along the trail. Almost all water you encounter can be consumed safely without any pre-treatment. I brought my filter along in case I needed it, but never ended up using it. 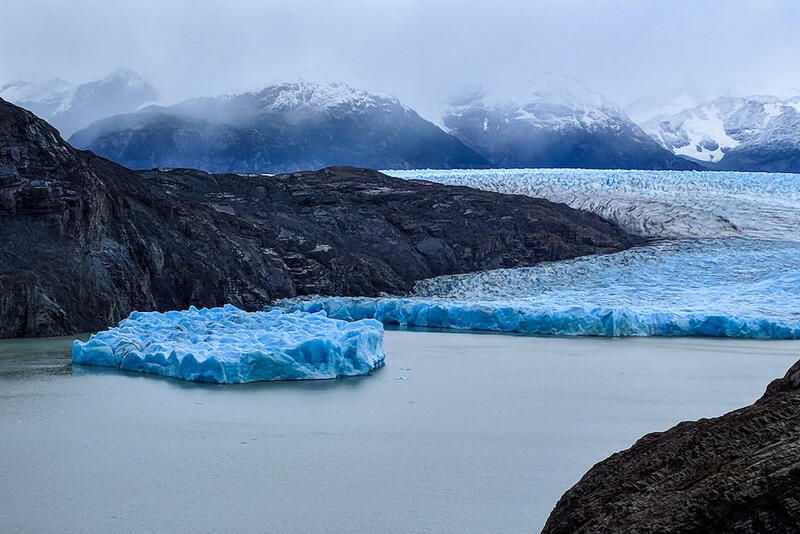 The water in along the ‘O’ Circuit is glacier-cold, clean, and fresh – a testament to the purity of Patagonia. I packed all six days worth of food, but doing so isn’t necessary, as there are many restaurants and re-supply stations along the trail. The food inside Torres del Paine is not cheap, so saving weight will end up costing you more money. I typically limit myself to around 2,700 calories a day. Plus, I always bring an extra day’s worth of food in case of emergency. There are few things worse than running out of food in the middle of the wilderness. IMPORTANT: If you are crossing into Chile from Argentina, you’ll have to go through customs and border control, and they won’t allow you to bring any meat products, eggs, cheese, fresh fruit, or vegetables into Chile. A customs officer confiscated a block of cheese and a stick of sausage from my bag at the border. 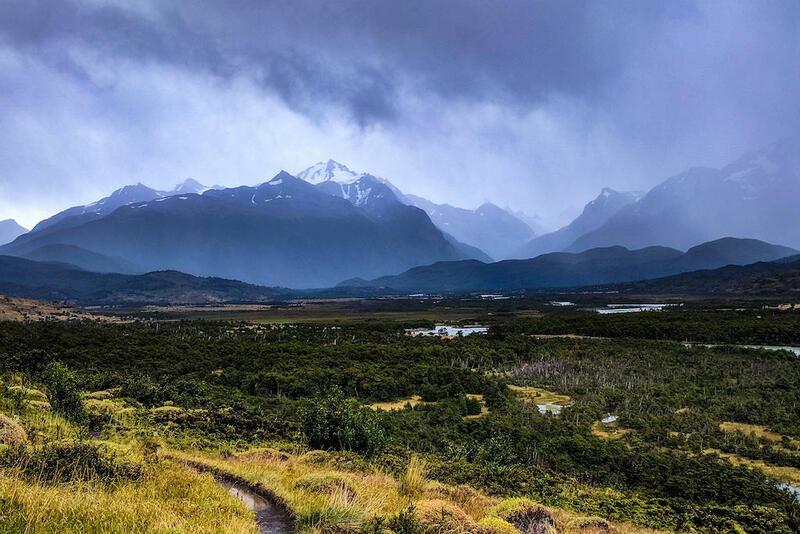 Hiking the ‘O’ Circuit’s 123 brutal kilometers (76 miles) in the harsh Patagonian wilderness is a formidable test of both body and mind. 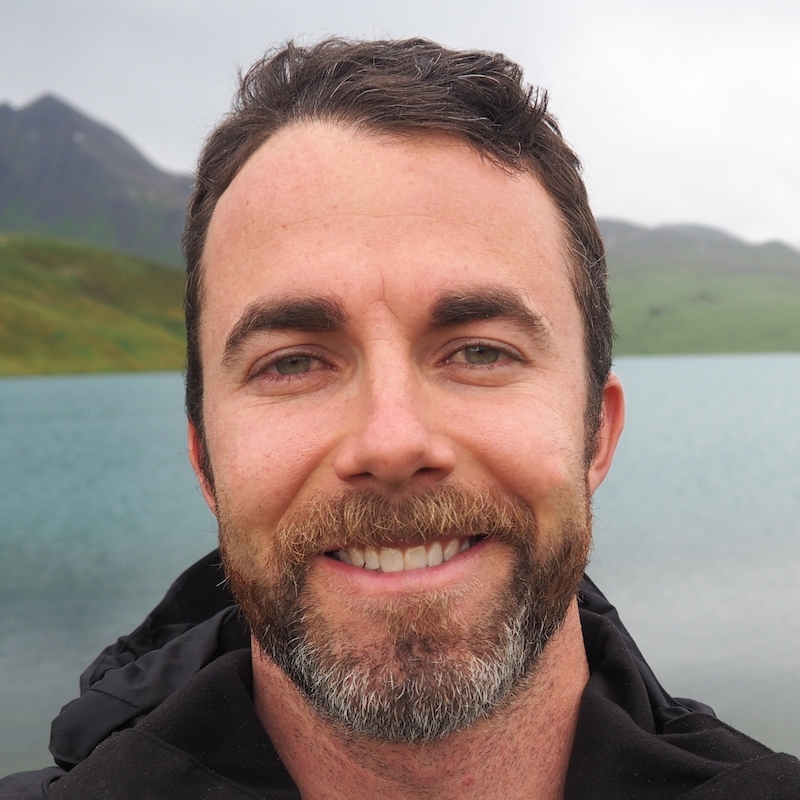 To prepare myself, I hiked, camped, and exercised regularly during the months leading up to the trek. By the end of the ‘O’ Circuit, I was absolutely beat, but still intact. I’m glad I prepared my body. If you’re concerned that you may not be ready for the tough terrain and distances ahead, start training now. 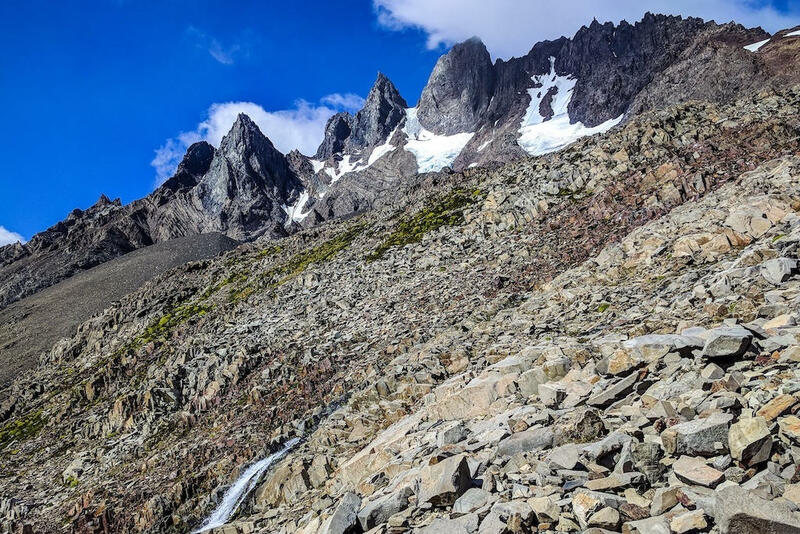 Knees can act up, backs can give out, and gear can fail you if you’re not adequately trained — both physically and mentally — for the rough conditions of Torres del Paine. Just a week before embarking on the ‘O’ Circuit, I trekked the Huemul Circuit in Argentina to get my body prepared. I highly recommend this trek. I’ve gone on challenging treks with minimal preparation, and they don’t always end up going so well. Always pack out everything you pack in! The ‘O’ Circuit is an extremely clean and beautiful trail. Let’s all work together to keep it that way for the rest of the world to enjoy. There are no excuses for leaving waste behind. If you feel like going the extra mile, fill a small adventure bag to help keep the trails clean. Visit LNT.org for more information on keeping nature clean and unpolluted. Now that I’ve covered all the preparation logistics you need, let’s switch over to the trekking experience itself. I completed the ‘O’ Circuit – plus 17 additional kilometers (10.6 miles) – over six days and five nights. Based on my experience, I’m giving you the exact six-day itinerary I would recommend. Keep in mind that most trekkers choose to spend 8-10 days hiking the circuit. If you choose to attempt the trek in six days, know that your average day will include considerable daily distance (20.5 km/12.7 miles) and elevation gain (823 meters/2700 feet). If your body isn’t prepared for these distances and elevation gains, do not attempt to complete the hike in six days. It is entirely possible to form your own unique itinerary from the information given in this article. Whether it’s six days, eight days, or ten days, create a plan that works for you! Ah, day one. The day the boots finally hit the trail. Months of preparation and anticipation are about to pay off. Reservations, weather forecasts, gear, food, training – it’s all in play now. It’s time to take the first step. Much of Day One is spent tangled up in getting to the trailhead. It’s a bit tedious jumping through all the hoops, but also completely worth it in the end. The views and scenery are magnificent right off the bat, setting the tone for the rest of the trail. I made the mistake of starting my adventure in El Calafate, Argentina. As I mentioned earlier, beginning in Puerto Natales, Chile is the smart way to go. You’ll save yourself a significant amount of money and time and won’t have to deal with a border crossing on the first day of your hike. Because I started the trek in El Calafate, I arrived at the trailhead much later than anticipated and had to adjust my itinerary. My bus (which ended up being a tour bus) didn’t end up leaving town until nearly two hours past its scheduled time. And since it was a tour bus, it made regular stops along the way to Torres del Paine. I was at my wit’s end by the time I got off the bus. Such is travel. Part of the reason the ride into Torres del Paine took so long, was a very long stop at the customs and border control office on the way into the park. In all, it took nearly an hour and a half for our bus full of chatty tourists to get cleared and through customs. 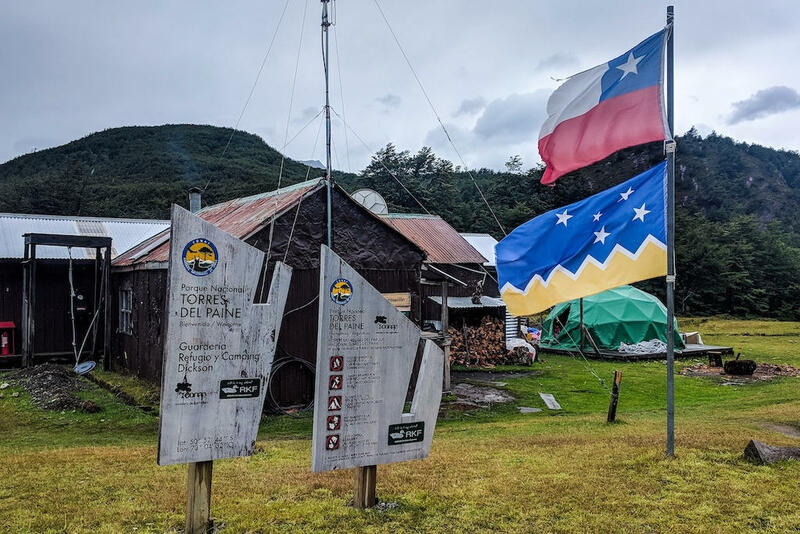 Whether you are arriving in Torres del Paine from Puerto Natales or El Calafate, it’s required to stop at the administration office on the way into the park. The mandatory fee of $31 US (21,000 CLP) must be paid in cash! Don’t forget to bring enough money – I nearly screwed this one up. If you’re hiking the ‘O’ or the ‘W’ Circuit, you must register at the park ranger station within the administration office before you start. The park rangers will need to see your reservations for every single night you plan on staying in the park. Be sure to have them at the ready, either on your phone or printed out. They’ll give you a map and a detailed list of the rules of the park. If you want to start the ‘O’ Circuit at Paine Grande as I did, you’ll need to take a boat across Lake Pehoé. There are affordable shuttles for $4 US (3000 CLP) that will run from the administration office to the catamaran dock. Luckily, my tour bus dropped me off at the dock, so I didn’t have to worry about transferring to a shuttle. The catamaran only departs five times a day, so be sure to check the schedule to find a time that works for you. There’s no need to book tickets in advance. The tickets are cash only. To start the trek at Paine Grande, you must take a catamaran across Lake Pehoé to reach the campground/refugio area. There are no buses that drop off at Paine Grande. Note: Information below is for December 1st through February 28th. Boats will run less frequently outside of these dates. The boat ride across Lake Pehoé offers stunning views of Patagonia’s famous ‘Blue Towers.’ I was blessed with a sunny and clear boat ride, so the mountains were unobstructed by clouds. Have your camera ready, as the photos ops are endless. 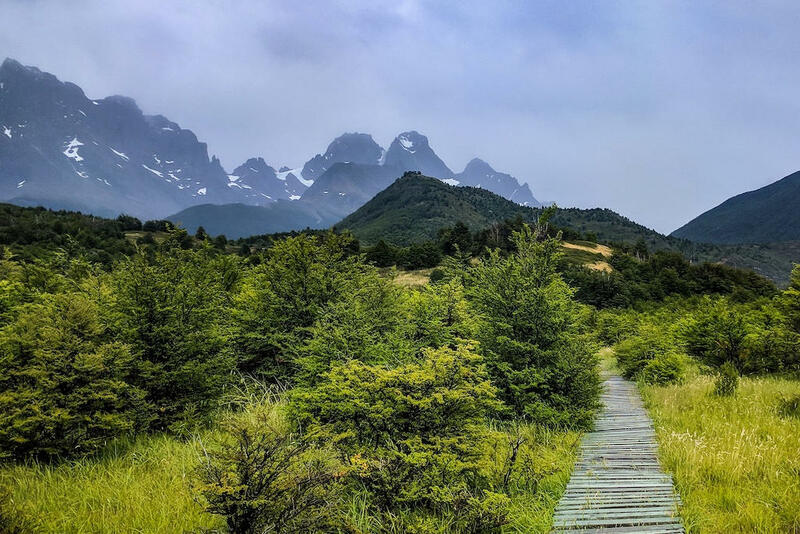 Once you arrive at the Paine Grande campgrounds, it’s (finally) time to start hiking. Because the backside of the ‘O’ Circuit must be completed counter-clockwise, your only option will be to begin hiking east along the trail, which will be easy to find. Camp Italiano is a comfortable 7.5 kilometer (4.7 mile) hike from Paine Grande. Once you arrive, check in with the park ranger and set up camp. Italiano is a free CONAF site with very basic amenities, so don’t expect to find anything beyond a tent site, a bathroom, and water. Put together a daypack with some water and snacks and get ready to see the first of two miradores (lookouts) of the Torres del Paine. Mirador Britanico is the first of two magnificent lookouts on the front side of the trek. To get to the lookout point requires a steep 5.4 kilometer (3.4 mile) ascent up the Frances Valley. On the way up the valley, you’ll pass the stunning Frances Glacier, where it’s possible to hear the booming and crackling of slabs of ice breaking free and sliding down the face of the mountain. The entire hike up the valley is stunning, and the breathtaking lookouts to the massive peaks are appropriate rewards for the tiring uphill march it takes to arrive. You’ll descend on the same trail, which will serve an early test for your knees. Take your time and use trekking poles if you brought them. Note: Because of my late start, I was forced to hike to Mirador Britanico at the beginning of Day Two. This made for two long and brutal days in a row. Try to avoid that. In terms of distance and elevation gain, Day Two will be one of the quicker days of the trek. For much of the day, gorgeous Lake Nordenskjöld will be on your right and the imposing Mount Almirante Nieto on your left. In terms of sheer beauty, Day Two was one of my favorite stretches of the trail. All the logistics – hostels, buses, boats, reservations, border crossings, and packing – are finally behind you. 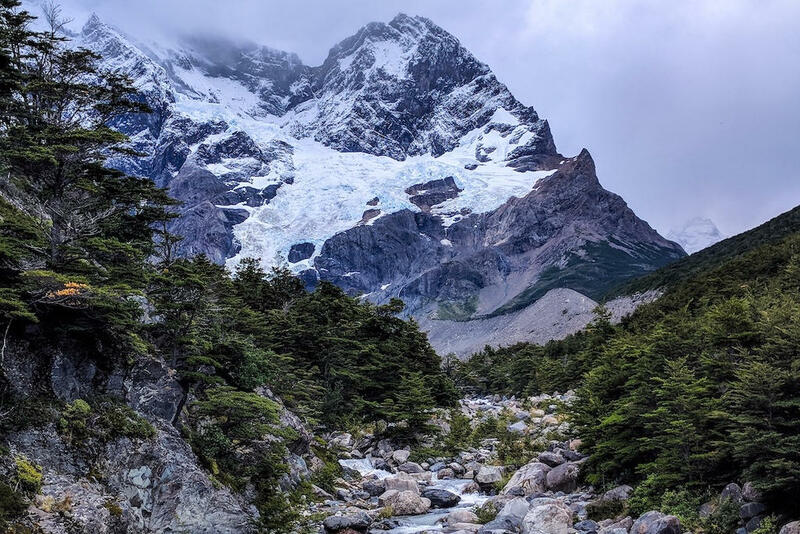 Now you can spend the rest of the ‘O’ Circuit focusing on the stunning beauty, physical challenges, and the erratic weather of Torres del Paine. It’s a joy to hike along Lake Nordenskjöld. There aren’t any more severe inclines, so it’s a comfortable, non-technical experience. Plus, the trail stays close to the shoreline of this pristine body of water. The weather for most of Day Two was close to perfect. I experienced zero rain and only light winds on the path to Camp Las Torres. That’s when it hit me — the ‘O’ Circuit was destined to be a once-in-a-lifetime trek that was already exceeding my incredibly high expectations. As I passed Lake Nordenskjöld and made my way to Camp Las Torres, the wind started to really pick up. The ‘O’ Circuit’s notorious Patagonian gusts flexed their muscles and pushed me around, so I put my head down and forged onward to find a place to pitch my tent. Camp Las Torres is divided into two sections: Central and Norte. Check in with at the ranger’s station to see which side to find a site. Las Torres is luxurious with its hot showers, resupply stations, a restaurant, electricity, and gear rentals, especially when compared to Camp Italiano. It’s a great place to freshen up and recharge your morale. Even if the weather is calm when you arrive at camp, do your best to find a site that’s protected from the wind. Look for spots that are protected by bushes, rocks, buildings, etc. Don’t camp underneath trees, where you and your tent are susceptible to falling branches. Ask the park rangers about the forecast and plan accordingly. Torres del Paine’s winds are known for wrecking tents and ruining trips. When I searched for a suitable site to set up camp, the wind kept howling. After a lot of head scratching, I finally found a campsite that was protected from the wind on three of four sides. Perfect. It was a tight squeeze to fit my tent in, but I was happy to have found the spot. Wind gusts that night reached nearly 100 km/h (60 mph). I put in my earplugs, snuggled into my sleeping bag, and went to sleep early that night. I was about to face the most brutal day of the circuit in the morning. If you want to squeeze the ‘O’ Circuit into six days like I did, count on some very long and tiring stretches. Today will be the longest and most exhausting of the bunch. Day Three is an extreme challenge both mentally and physically, but the rewards along the trail are plentiful. 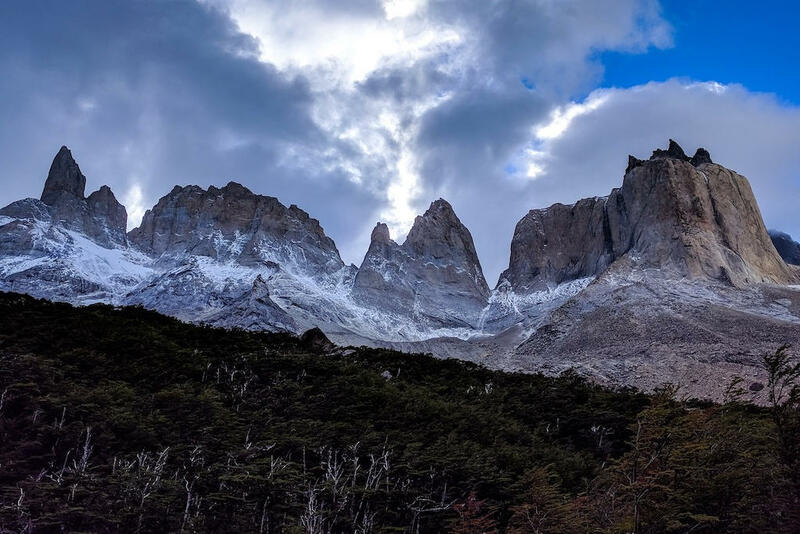 You’ll soak in the most famous view of the trek, Mirador Las Torres, an unbelievable vista of the jagged granite peaks that photos just don’t do justice. 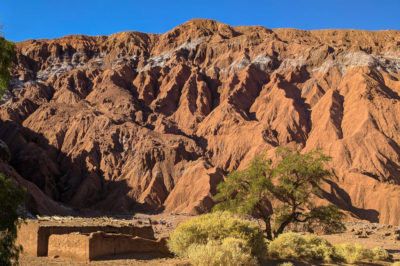 Note: If you want to make Day Three less daunting, spend the second night at Camp Chileno – this will cut 5 kilometers (3.1 miles) and considerable elevation gain off the start of your sharp incline. The rigors of Day Three will require an early start – preferably three or more hours before the sun comes up. The goal of most trekkers is to witness the sunrise cast light onto the sheer towers of rock. Apparently, this is quite the sight to behold, but I wouldn’t know. I slept through my alarm. I chose to leave my tent wholly set up for my hike to the towers to save weight on the trail. Doing so was risky, but ultimately everything was intact when I got back. The hike up to the towers is 9.4 kilometers (5.8 miles) of calf-burning ascent, which challenged me more than any other section of the trek. The further I climbed, the windier it got. By the time I reached the towers, the wind was whipping small gravel into the air and stopping me dead in my tracks. It was a true test of mental endurance but proved worthwhile in the end. Here’s the ‘O’ Circuit’s vivid Patagonia postcard moment. Towers of granite shoot straight into the sky, cutting into the clouds. An ice-cold lake below collects the runoff from Glacier Las Torres. It’s a truly majestic view that makes you forgive the cold, windy, and draining ascent that brought you there. All too briefly, I soaked up the view of the mirador until the wild weather (and my depleted snack supply) forced me back down the trail to Las Torres Camp. I was thankful for my trekking poles – they took the pressure off my knees for the duration of the long descent. The crowds thin out considerably between Las Torres and Serón. You no longer have to share the way with ‘W’ Circuit hikers, so the trail opens up, and a sense of solitude sinks in. I encountered more horses than humans along my walk to Serón. The scenery quickly changes once you start the backside of the trek. The trail is calm, flat, dry, and winding – a welcome break from the first half of the day. The broad River Paine snakes its way through the open valley, guiding the path towards the next patch of earth to set up camp and recharge. By the time I got to Serón, the wind had picked up yet again. The forecast called for more powerful wind gusts of 100+ km/h (60 mph) throughout the night. Because of my late start, I arrived to find a packed campground. I set up shop in one of the last spots available, secured my tent, and braced for another intense and windy evening. After a hot shower, I dozed off quickly and slept like a baby through a night of fiercely buffeting winds. The hike from Serón to Dickson is far less challenging in terms of distance and elevation gain than the day before, but the weather will ultimately dictate the pace on this leg of the trip. I didn’t get so lucky with the rain and wind on this stretch. After I packed up camp, I asked the staff at Serón about the forecast. They told me to expect steady rain and wind throughout the course of the day. I moved my rain pants and jacket to the exterior of my pack for easy access and started off towards Dickson. The staff’s forecast would prove all too accurate. Check the forecast whenever you have the chance. I’m glad I did. Fairly quickly after Serón, you will encounter a short but exposed pass that is notorious for its high winds. The elevation gain is mild compared to other portions of the ‘O’ Circuit, but the weather can make this section quite formidable. Heavy rain coupled with furious wind made for brutal conditions as I trudged through the most challenging weather of my entire trek. Beads of water stung my face like needles as the powerful Patagonian gales whipped and cut in every direction. Then, in an instant, the wind and rain stopped, and a vivid double rainbow opened up over the trail. My frustration turned to amazement – a common occurrence on this trail. After the pass, the trail flattens out on the descent to Dickson. You’ll need to check in at the Coirón ranger station and present your passport and camping reservations. There you can find covered picnic tables, making it a great place to stop for lunch. The wind settled down after the pass, but the heavy rain persisted until I reached Dickson. I arrived at camp depleted and soaking wet, itching to set up my tent and retreat to my dry zone. There’s a large, open shelter at Dickson to hang out clothes and, in general, escape the elements. I was among dozens of campers taking advantage of this dry oasis. The refugios are also great places to dry out and recharge. I thoroughly enjoyed flipping through the guestbook and reading the vivid memories left behind from trekkers of years past. The sites at Dickson are fairly spread out, with some very scenic spots available for the taking. Once you set up camp, walk to Lake Dickson and soak up the magnificent views before night settles in. 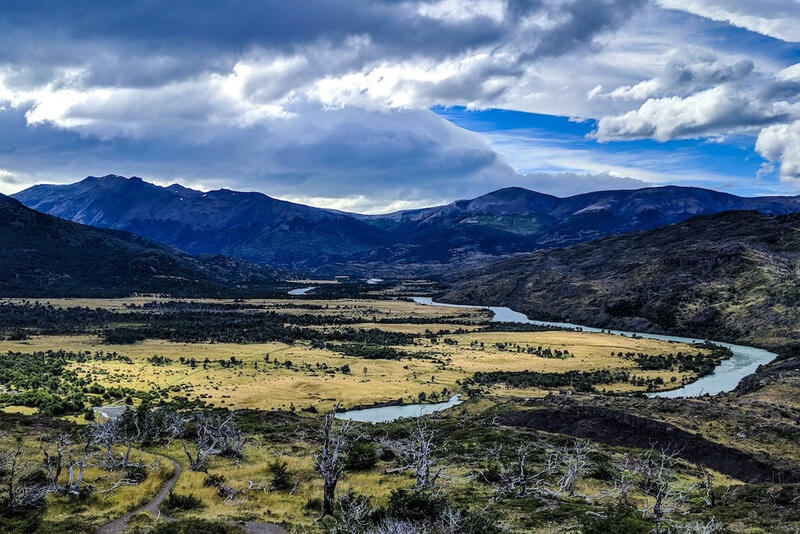 The eternal Patagonian beauty of Torres del Paine continues on Day Five as you reach the high elevation point of the ‘O’ Circuit, John Gardner Pass. At 1200 meters (3900 feet) in elevation, this pass is (surprise, surprise) known for its heavy winds. Try to reach the top anytime before noon, which is typically the calmest period. Be sure to catch the sunrise over the mountains behind Camp Dickson before moving on towards Paso. It was one of the highlights of my trip. From Dickson to Paso, I had a perfect mix of stunning scenery, solitude, and superb weather. It was my favorite leg of the trek. Most trekkers are slow to leave Dickson. The most common plan of attack is to make the manageable 11.8 kilometer (7.3 mile) hike to Los Perros campground and stop for the day – saving John Gardner Pass for the next morning. Because of this, the early birds often have a quiet and uncrowded trail ahead of them. I got such an early start and didn’t see another human for the first three hours. Rise with the sun and have Torres del Paine all to yourself. It’s mandatory to check in at the Los Perros ranger station, even if you don’t plan on spending the night. Park rangers need to take down your information and give you the green light before you can proceed. On dangerously windy days, rangers will not allow trekkers to attempt the daunting mountain pass. Luckily, I experienced none of the awful wind that I had read so much about. The weather was perfect, and I was treated to spectacular views of the valley below as I slowly climbed in elevation. Glacial streams and cascading mini-waterfalls were everywhere as I approached the pass. Once you reach the top, you’ll get your first view of Glacier Grey. A glimpse of this sprawling glacier is a sign of good things to come. In my notes, I wrote that hiking John Gardner Pass “was like living in a dream.” This stretch of trail is destined to be one of my favorite lifetime hiking memories. I’m so grateful the weather cooperated that day. The descent from John Gardner Pass is just as steep as the walk up, so prepare your knees for another tough test. Descend slowly, use trekking poles if you have them, and do not rush this stretch of trail. The facilities at Paso reminded me a lot of Camp Italiano. Both campgrounds are free (thank you, CONAF) and offer bare-bones amenities. Tent sites, toilets, and water – that’s pretty much the extent of it at Camp Paso. Paso sits at a higher elevation than any other campground on the ‘O’ Circuit. Be prepared for significantly colder weather and a high probability of wind and rain. For me, night five was chilly and restless; sleep was hard to come by. It’s time to put a bow on the ‘O’ Circuit. This final day on the trail offers tremendous views of the massive Grey Glacier and the impressive length of Lake Grey. This last stretch of trail is breathtaking and relatively mild in terms of elevation gain – a perfect end to a most memorable trek. It’s also possible to hike an additional 17 kilometers (10.6 miles) to turn your experience into the ‘Q’ Circuit. This very flat stretch of trail runs from Paine Grande all the way back to the administration office, cutting out the need to take the catamaran back across Lake Pehoé. Exhaustion, sadness, excitement, joy, frustration – I ran through the gamut of emotions on Day Six. What an utterly bittersweet day. 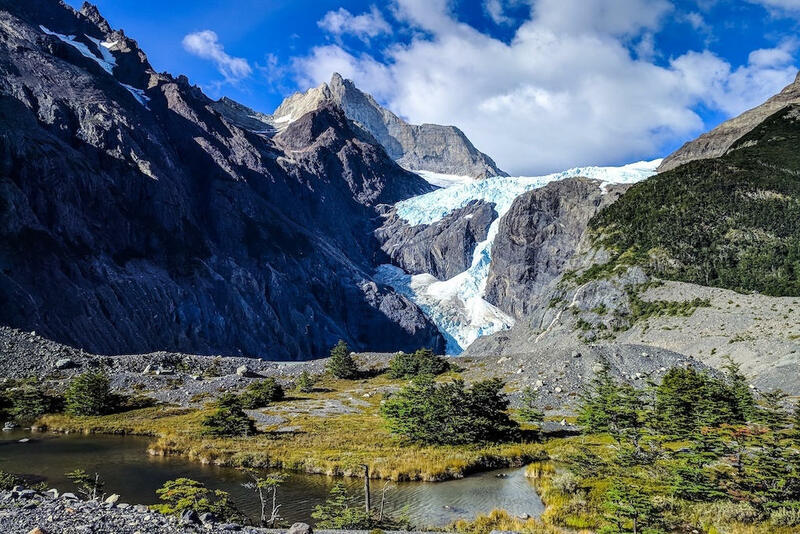 Day Six brings spectacular views of the imposing Grey Glacier, which is but a slice of the vast South Patagonian Ice Field that spans more than 12,200 square kilometers (4,700 square miles). I recommend stopping at every possible lookout to soak up the enormous and humbling vistas. Along the way, you’ll cross three suspension bridges that dip with each step and sway with every gust of wind. Trust the bridge engineers and enjoy the ride. You’ll soon reach Camp Grey, a great place to drop your pack, grab a quick lunch, and give your body a break. There’s a short trail to a lookout above the shoreline, a great spot to snap a few more photos. As you leave Camp Grey, you’ll climb one last incline, a modest 400 meter (1300 foot) gain in elevation. This stretch of trail is part of the ‘W’ Circuit, so it will be a bit more crowded than the backside of your trek. Once you top out in elevation, you’ll slowly descend back near sea level as you return to Paine Grande and the Pehoé catamaran dock. Once there, you’ll have completed the ‘O’ Circuit! It’s time to take off your pack and grab a beer at the nearby restaurant. You’ve definitely earned it. Check the schedule and hop on the next Pehoé catamaran back to the administration office. From there, find a bus or hitchhike towards your next destination. Check the catamaran departures schedule in the Day One section of this post. 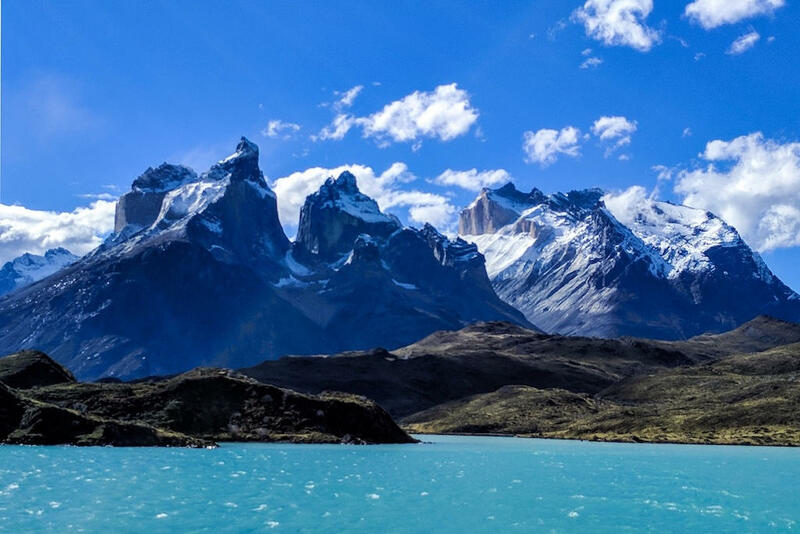 Not quite ready to say goodbye to Torres del Paine? Extend your adventure by foregoing the catamaran and walking your way back, as I chose to do. By doing this, you’re turning the ‘O’ Circuit into the ‘Q’ Circuit, and soaking in more of Patagonia’s splendor. The trail back to the administration office was nearly empty for the entire 17 kilometer (10.6 mile) haul – I only saw three other people the whole time. It was also very flat and straight, a huge relief since I was walking my longest day yet on the circuit. The return hike along Lake Pehoé is spectacular. I turned around regularly to soak in the last precious views of Torres del Paine. Not many people choose to hike this extension, but I highly recommend it to anyone who still has fuel left in their tank. It’s the cherry on top of a life-changing trek. You’ll eventually reach a paved road that leads back to the administration office. From there, catch a bus or post up at an intersection and hitchhike like I did. I stuck my thumb out and had a ride within 10 minutes. A Chilean man in his late 50s picked me up, and we chatted the entire way back to Puerto Natales while the Patagonian sun crept lower. I couldn’t believe it – I’d completed the ‘Q’ Circuit in six exhausting and wonderful days! When I was dropped off on the edge of town, I limped to my hotel, sprawled onto a real bed, smiled exhaustedly at the ceiling, and drifted off to a deep sleep. For weeks after the ‘O’ Circuit trek, I struggled to find a way to express fully what I’d just experienced. Now, nearly a year later, my writing is but a faint echo of those six glorious days. Words may fail me, but travel doesn’t. 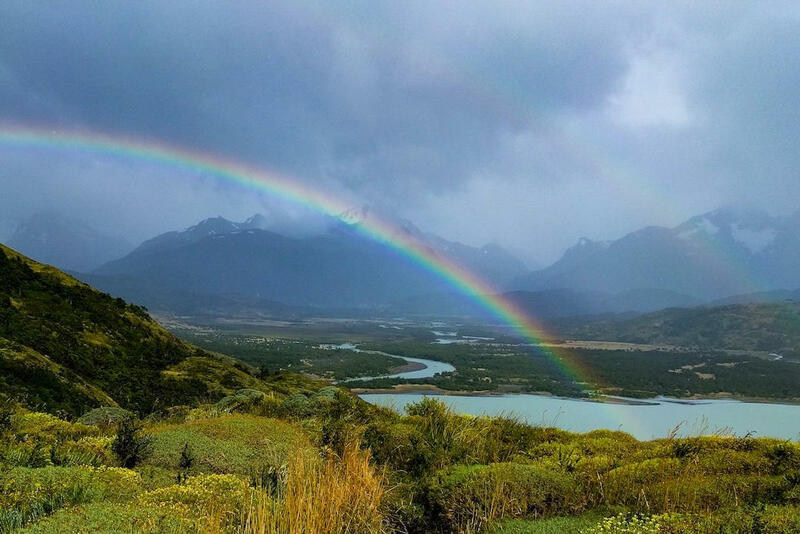 In Torres del Paine, I’d traversed alongside towering granite spires, immense glaciers, peaceful waterfalls, serene mountain lakes, and endured a torrent of unpredictable weather. It left me with a powerful sense of unique beauty that is beyond capturing. All the anticipation and preparation I put into that trek was repaid to me with a flood of profoundly vivid lifetime memories. Torres del Paine left me uplifted, humbled and hungry for more. One day, I’ll return to Patagonia to see what other wonderment lies on the horizon. In the meantime, I’ll continue exploring the Earth and searching for other special places that will expand my soul. They’re out there and, by traveling, I can find them. 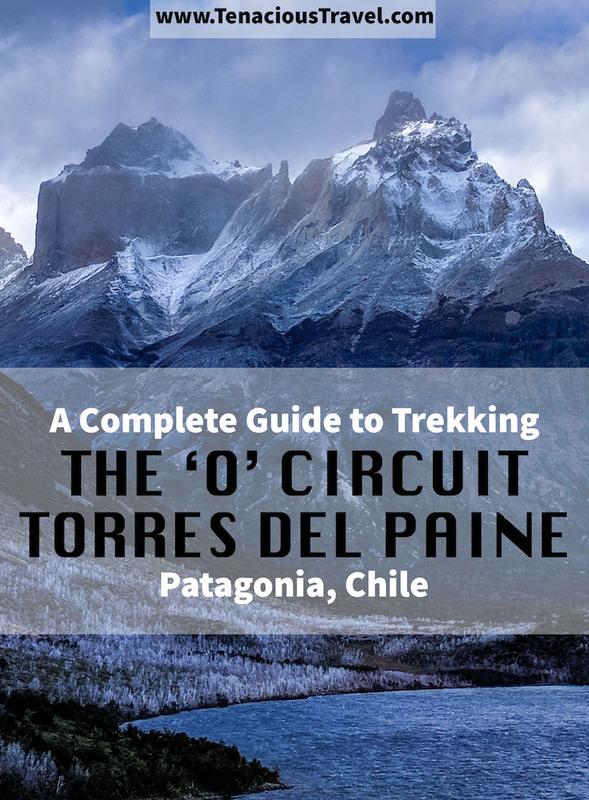 Do you have any interesting stories or valuable advice about the ‘O’ Circuit or any other great hikes in Patagonia? Do you have any questions that the guide didn’t answer? Give me some feedback by leaving a message in the comments below! Glad the article helped you! I know what it’s like to try and complete a trip through several blogs all at once. It’s frustrating! That’s why I tried to create an article where you don’t need to leave the page to figure things out. You comment made me realize that I need to address “Hiking in the Off-Season” in my article. I’m going to add that to the article as soon as I know more. Unfortunately, I haven’t hiked the circuit in the winter, so I don’t have any real life experience. A guy named Nehpet Loway commented on my link in the hiking group and told me that he did the hike in the winter. I would recommend finding him on Facebook and asking him about his experience. I’m guessing he’d be glad to help! 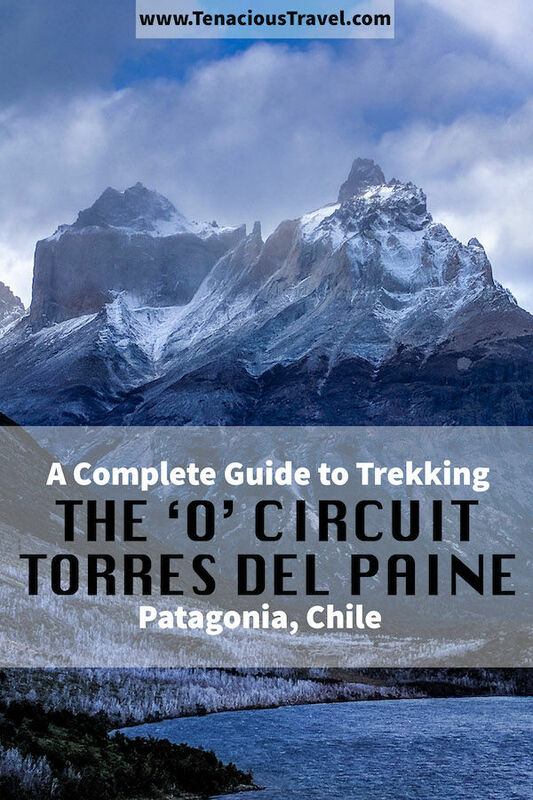 Here’s the best article I found on trail conditions in the winter: https://www.swoop-patagonia.com/chile/torres-del-paine/winter I’m guessing the ‘O’ Circuit is doable with a good GPS map (maps.me), but I can’t guarantee anything. Again, talk to Nehpet Loway. Don’t talk my word for it. 1. Don’t go on the hike alone! Bring at least one hiking partner along with you and preferably bring a rescue beacon in case you get lost or stuck. If you are having trouble finding someone, join the Backpacking South America Facebook group. 2. Prepare for very cold and possibly snowy conditions. This hike can stay below freezing with high humidity, which are not conditions to be taken lightly. Make sure you have the right gear. The good news is that traditionally, the winter is less windy. The wind was the hardest weather for my to handle. 3. Have a Plan B and Plan C in place. If you get to Torres del Paine and are stopped from hiking the trail for whatever reason, you need to have a backup plan. It would be a shame to make a trip all the way down there and get turned away with nothing else to fall back on. 4. Plan on starting your trip at Los Torres Campgrounds. Unless the boats to Paine Grande and Grey run in winter, this seems to be your only option. 5. Make an 8-10 day itinerary for yourself. Six days seems a bit ambitious in unpredictable and un-maintained winter conditions. Take your time and do it right. wow, this post is really nice ……thanks for sharing …….